We begin our service with consoling words of Psalm 23. Please join me…. We are an ancient people well acquainted with grief, well acquainted with the journey through the valley of the shadow of death. Sorrows are not strangers to us and yet the centuries have taught us that a good name endures beyond the grave and there is strength in faith and G-d.
Today is Rosh Chodesh Av, the beginning of the 9 sad days in our history. The time of remembrance of the destruction of both of our Temples as well as many sad incidents of our people in our times past. And here we are at our Kneseth Israel biding a sad farewell to our member and friend Sondra Snyder. Although Sondra Snyder had been ill the past year, yet her sudden passing left everyone in shock. Sondra, the sister of Michael, sister in law of Gail. Aunt of Paula and Leland Niece to Bill and Marty and many cousins and friends. "G-d has given and G-d has taken away, Blessed be the name of G-d." Though we grieve this day for our loss, we also give thanks to the Almighty for gift of her life that benefited many. Sondra grew up in Annapolis, the daughter of the late Ruth and Maurice Snyder. She was devoted to many people and many causes – friends speak about her as being a caring, competent and compassionate person. She felt very close to our synagogue, Kneseth Israel, a place where the Snyder family has always been deeply dedicated. She was a past member of the Board of Governors and the past President of the Sisterhood. 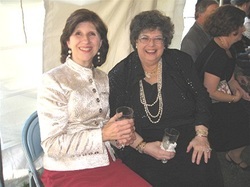 Our synagogue was fortunate to have Sondra as a devoted head of the Sisterhood catering for many years. We remember vividly her delicious foods, her bubbly personality and generous heart. She was talented particularly in art and jewelry. She liked to give and to help others. Even in the hospital people remember her with a good spirit. It is painful for us that Sondra is laid to rest in the prime of her life. Her passing coincides with the Hebrew calendar the 9 days in the month of Av, the time of Jewish mourning and tragedies and a time when so many precious lives were taken individually and collectively from our people. It is doubly sad time and a reminder of the pain we feel when a member and friend is taken from us. Judaism believes that through our own actions, the souls of those who passed on can attain something different they could not achieve on earth. Upon the burial we start the recitation of the Kaddish prayer for the benefit of the departed soul. We also study Torah and give charity. The mitzvot that we do, with the intention that it be l'iluiy Nishmat, for the sake of the "elevation of the soul" is for the sake of the departed soul. If the desire to give honor to the one who has passed on is what impels us to learn something we would not have otherwise learned, or to do a mitzvah we otherwise would not have done, then Sondra’s soul lives on in us. Interestingly, the Kaddish, the Jewish prayer for mourning, never speaks of death, but often speaks of peace. We are here today to share the pain of Sondra’s death with her family. Michael Snyder is here every morning for many years to help others recite Kaddish for their loved ones. Now, it is our obligation to give back and to help Michael say Kaddish for his sister. In its closing words, may our hearts find a measure of comfort and our souls, the eternal touch of hope. "Ya'ase shalom bimromav, hu ya'ase shalom aleinu, ve-al kol Israel, ve-imru, amen." We need to increase our mitzvot - we need help each other especially now at the sad time. Our G-d and G-d of our Fathers, may thou permit the soul of Sondra known in Hebrew as Sheina Etel bat Moshe who you call upon, be freed from earth’s painful struggles and difficulties, and be purified through thy mercies. As we honor Sondra’s life and memory, we pray that G-d will grant us good health and peace. We pray that G-d will also help us to brighten our days and our spirits. We acknowledge the presence of those who came to pay tribute to Sondra. We pray that her good nature, fine name and good deeds will live on in the hearts of her beloved family and friends. May G-d remove the tears upon the eyes of the mourners, and bring comfort to the family. Amen. Shivah Minyans will be observed at the home of Michael and Gail Snyder at 1308 Hawkins Lane, Annapolis tonight, Thursday, Sunday and Monday at 7:00PM and Saturday 9PM and every morning at 7:30AM at the synagogue.